Before we begin with this week’s installment of This Week in Geopolitics, I want to draw your attention to the 2018 Strategic Investment Conference. Last year at the SIC, I said the United States would likely launch a pre-emptive attack on North Korea. I failed to anticipate the level of opposition from South Korea, which would bear the brunt of the casualties in such an attack. Without South Korea’s support, the US reconsidered its position. No attack came. And indeed, the world is at a crossroads. The post-2008 financial crisis “recovery” has not curbed speculation or reduced inequality. It has not halted the rise of political instability in the world’s most important countries. As Europe celebrates what 10 years ago would have been meager growth rates—and as the US celebrates sky-high stock prices one day only to watch them fall the next—the world stands on a precipice where the choices seem to be imminent chaos or delayed crisis. I hope you will join me at the SIC this year to discuss these important questions with experts from around the world, but if you can’t, Mauldin Economics has made it even easier for you to experience the insights by offering the SIC 2018 Live Stream Virtual Pass, where you can watch all of the action live, and even submit questions to panelists. You can find further information here. I look forward to answering your questions, whether in person or virtually. Without further ado, let’s get to This Week in Geopolitics. Was the recent sell-off a warning of what is to come in 2018, or a great buying opportunity? Are we at the end of the 37-year bond bull market... or are yields headed lower? Being on the wrong side of these trends could destroy your financial future. Watch 25 of the world’s top money managers and investment strategists LIVE as they chart a success path forward! The cascading effects from even one or two relatively small weapons exploded in optimum location in space at present would almost certainly shut down an entire interconnected electrical power system, perhaps affecting as much as 70 percent or possibly more of the United States, all in an instant.… Should significant parts of the electrical power infrastructure be lost for any substantial period of time, the Commission believes that the consequences are likely to be catastrophic, and many people may ultimately die for lack of the basic elements necessary to sustain life in dense urban and suburban communities. 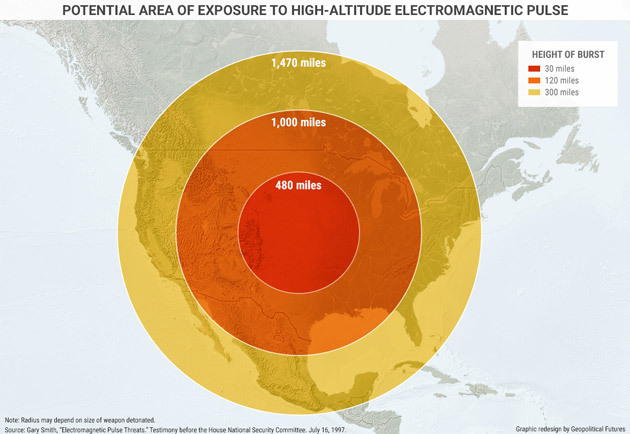 This is why the North has floated the possibility of an EMP attack. It knows that the US knows it still needs time to make its traditional nuclear deterrent credible, and it's looking for ways to stall a US attack until it crosses the Rubicon. 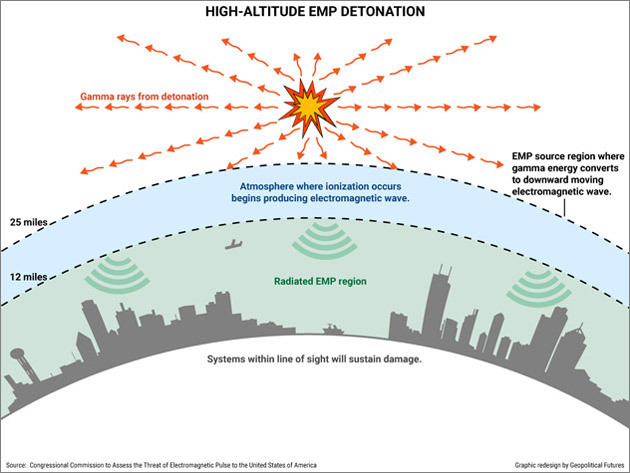 An EMP attack may or may not live up to the hype. But the possibility that it could cause serious problems for the US, combined with the possibility that the North will empty its chamber when under attack even if doing so invites massive retaliation, gives the US one more factor to consider before moving forward with the military option. Feb. 20, 2018, 12:30 p.m.
Feb. 19, 2018, 9:22 p.m. So let’s EMP them first. No casualties. Destroys Command and control. Destroys electronics in all warheads.